There are many resuscitation aids available to augment First Aid kit but few do very much more than to provide a hindrance to ventilation. In particular; so called rescue sheets may cause unwitting cross-contamination and most definitely reduce the effectiveness of patient ventilation, making it harder to attain 'rescue-breaths' and reducing the chances of a successful rescue. By testing to scientific protocol used for similar respirator components, this report reveals the degree to which such devices can fail to protect against cross-contamination. Even facemask type devices, with proper face-seals, failed to offer appropriate protection: the various types of valves and filters incorporated in to them, inadequate to meet recognised tests. Only one or two tube-type resuscitation aids proved effective in protecting against cross-contamination and in providing acceptably low resistance to the passage of air, at important ventilation rates. Although this report was carried out in 1992; commissioned by the HSE; there have been no subsequent attempts to repeat or extend its findings. 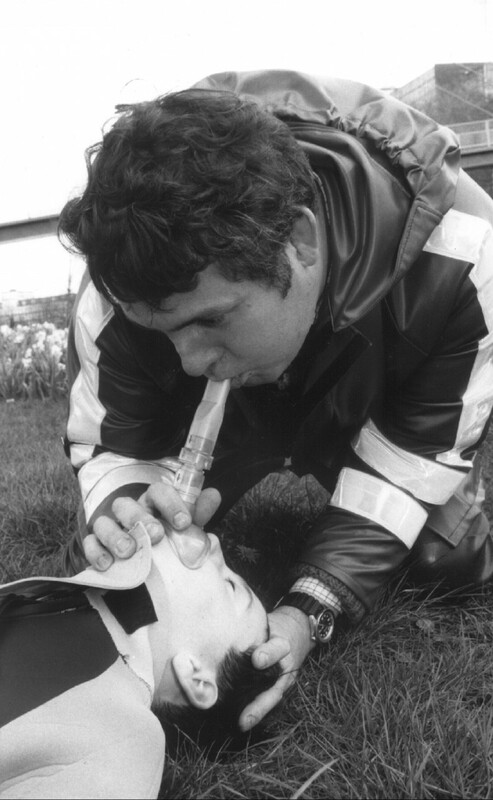 But: as a result of the report, some manufacturers endeavoured to improve their products; especially in respect of breathing resistances but yet there remains no internationally acknowledged standard for resuscitation aids intended for 'manual' (rescue-breath) devices. A formal test standard - especially one; as so many are so; based on design characteristics, rather than up on performance, is probably unnecessary. Indeed; if the former; it would be unwelcome. Too often have test protocol presented constraints to innovation and improvement. Better is a little, tutored fore-thought by customers who will base purchase specifications on such better knowledge as is here offered. Our advice is to make realistic assessment of contamination risks and to ensure that resuscitation aids provide at least the low breathing resistance of the Porta-breath. Otherwise; do it the old fashioned way - mouth to mouth; with all that entails and don't waste money on kit that will not work as advertised! I have done half a dozen, real-life, mouth-to-mouth resuscitations but have yet to catch a disease, or to pass one on, as a result. Luck? Perhaps so but we do have 'on-board' anti-infection systems, which mostly tend to work! Click the button below to add the Institute of Occupational Medicine: Resuscitation Aid report to your wish list.